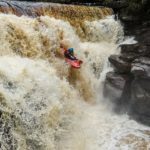 How to shoot paddling with a DSLR | DBP MAGAZINE ONLINE The World's Best Free Whitewater Publication. We bring your the next instalment in the series by DBP executive editor Tom Clare about how to take your whitewater edits to the next level. This time, it is covering DSLR’s and similar cameras. Check out the section on how to get the best from your gopro if you haven’t already done so, and keep an eye out for the next instalment next month. So, you are now a gopro whiz. You know all the ins and outs, and get all the shots. But still, you notice compared to the likes of torryd (see the video below) you are missing something. That “secret sauce” is proper video cameras, ranging from cheap DSLR’s all the way up to 6 figure cinema cameras. The sky really is the limit, but even a relatively cheap DSLR will give you footage that you just can’t get from a gopro. For that reason, and that they are far more affordable and versatile than dedicated video cams, we will mainly be talking about DSLR’s in this article. DSLR’s themselves come in all shapes and sizes, from little entry level units up to $6000 pro beasts, and that is before you get to the lenses! As well as being great for video, they are the best way to get epic photos of kayaking as their capabilities are far beyond any point and shoot. The first thing you might notice when you start looking at DSLRs is how much choice there is. Canon, Nikon and Sony are the big players (Sony’s cameras are somewhat different being mirrorless but they are similar enough). They come in all price ranges, and there are a lot of reviews out there on the wider internet. A good middle camera which has all the features you would need while being not too expensive would be the Canon 70d/Nikon D7200/Sony A6000 series cameras. One thing to watch out for is that owners of the different brands tend to get rather tribal over their choice of camera! Don’t just go for the ones with the loudest advocates! Take the time to shop around and decide which is best for you. Having interchangeable lenses is what really sets DSLRs apart from Gopros, point and shoots and the like. With the push of a button and twist of the wrist you can change from having a super wide angle lens to a super telephoto(high zoom). The amount of lenses available for DSLRs is simply staggering, with something to fit nearly every need and budget. All lenses are a compromise between their optical quality, zoom amount, weight and price. At one end of the scale you have the $20 000 mega lenses used by pro’s to shoot surfing from the shore, and at the other you have the $50 lenses that come with most cameras. These are known as “kit lenses”, and are mainly focused on being small, lightweight and cheap, while offering decent optical performance. Their one big downfall is that they are not very good in low light. These lenses are pretty good options for shooting whitewater video, as their small form factor makes them easy to get in a drybag or peli case (more on that later!). If you want to buy another lens, I would recommend getting a fixed zoom “prime” lens in the region of 35mm. These tend to be tiny, optically brilliant and excellent in low light, making them a good addition to the flexibility of the kit zoom. If later you are looking to extend your lens collection (it gets addictive! ), I would recommend looking at the bigger telephoto (zoom) lenses for kayaking. While a lot more difficult to get in somewhere dry, they mean you can get right up close to the action. Something to bear in mind with longer zooms is that you’ll likely need a tripod to get steady shots. Something that you will immediately notice picking up a DSLR is that it has a lot of controls and buttons! This might seem a bit intimidating, but that level of control allows for you to get the results that you want, no matter what the conditions are. The first setting to to get your head around is the ISO. It is effectively a measure of the sensitivity of the camera towards light – the higher the number, the higher the sensitivity. The trade off for the higher sensitivity is more noise (coloured speckles and grain) in your video. In general, try to keep ISO as low as possible, unless the light is poor. The next important setting is the lens aperture. This is the size of the hole in the lens that allows light through to the camera. 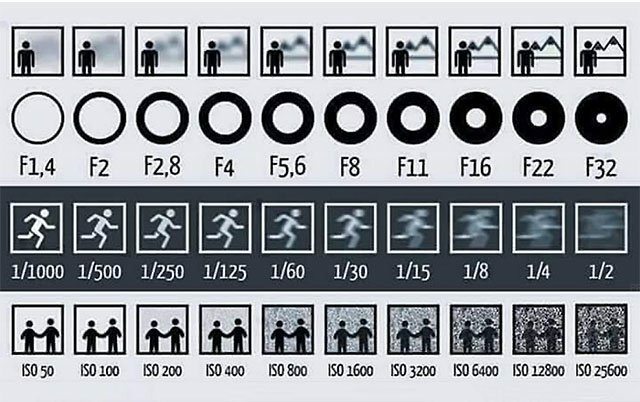 In a rather confusing twist, the lower the number (F-stop), the wider the aperture and the more light is let through to the camera. It isn’t just about the amount of light though, as the aperture also effects the depth of field, the amount of the image that is in focus. This allows you to either have everything in front of you in focus, or for you to gather peoples attention onto a certain object. The last part of the triangle is the shutter speed. This is the amount of time that the camera captures the image for, not to be confused with the frame rate! If you are aiming for a cinematic feel to your images, try to go with a shutter speed roughly 2x the frame rate of the camera, ie for a 30fps video 1/60 shutter speed. You might need to push it higher to maintain the image exposure, but that is all part of the balancing act. It might seem like a lot to try and take in, but as you get more used to it you learn to dial in the settings needed for each shot as second nature. For reference, take a look at the image below. It summarises the triangle, more for still images but still applicable to video. As good at taking photos as all this camera gear is, it has one big flaw: it is not waterproof. This means you either have to be a dedicated cameraman for the day, or use some kind of waterproofing to keep your expensive gear safe. There is two main options for this. A peli case or similar or a watershed drybag. Both have their advantages and disadvantages, but both will keep your gear dry, even if you decide to go for a swim! One thing to avoid is “roll top” drybags and similar. While a lot cheaper than pelis and watersheds, they will not keep your gear 100% dry, especially if it gets immersed. The main advantage of the peli case is that it is a rigid plastic box. It protects your gear from all external influences. The main disadvantage is that if you are a kayak paddler fitting that box somewhere can be a pain! Watershed’s on the other hand are a lot more flexible and easier to fit in the back of a boat. They are however flexible, so might not protect so well from an impact. We hope that this article has been informative about shooting video with DSLRs. The main advice we can give is to get out there and play! Practice makes perfect, and the more you experiment the better you will get. Look out for the next article in this series, in which we will cover getting the shots you want to start to put together a video.